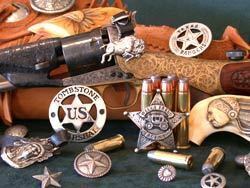 Buffalo Brothers Cowboy Store has outfitted many SASS shooters guns with our pistol grips, badges Conchos and buttons. PLEASE NOTE: WHEN YOU PLACE YOUR ORDER, YOU WILL HAVE 2 OPTIONS FOR PAYMENT, PAY IN ADVANCE OR PAYPAL. IF YOU CHOOSE PAY IN ADVANCE, YOU WILL NEED TO CONTACT ME TO GIVE ME YOUR CREDIT CARD NUMBER OR MAKE OTHER PAYMENT ARRANGEMENTS. IF YOU WISH TO PAY ONLINE AND USE YOUR CREDIT CARD, YOU CAN DO THAT THROUGH THE PAYPAL PORTAL.